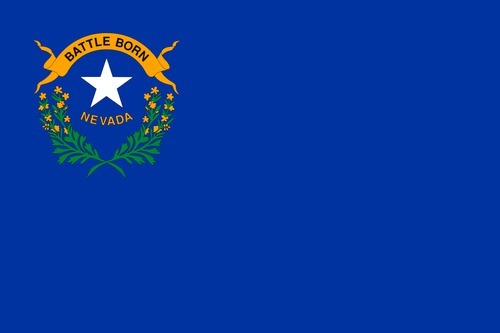 Nevadaite: Mineral information, data and localities. First referred to as Unknown #1 by Jensen et al (1995). Named by M.A. Cooper, F.C. Hawthorne, A.C. Roberts, E.E. Foord, R.C. Erd, H.T. Evans Jr., and M.C. Jensen in 2004 for the state of Nevada, USA, that includes the type locality of the Gold Quarry Mine. 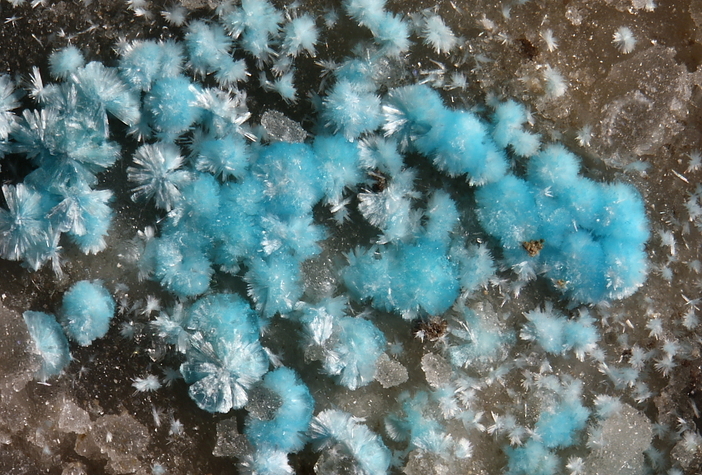 This page provides mineralogical data about Nevadaite. Radiating clusters to 1 mm of prismatic crystals, occasionally covering surfaces greater than 2 cm diameter. 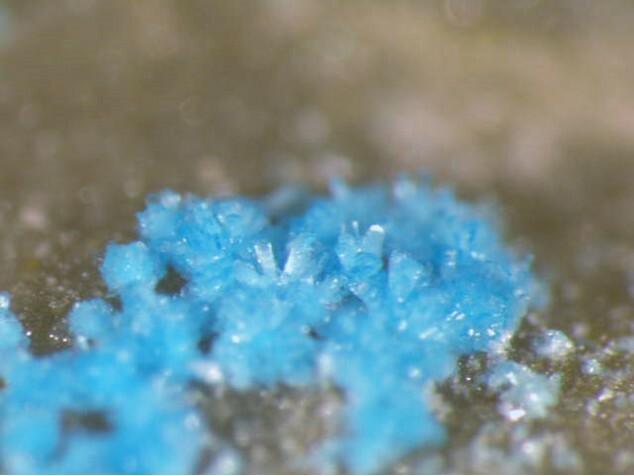 Individual crystals are elongate on  with a length:width ratio of greater than 10:1 and a maximum diameter of approx. 30 mm. Also as spherules and druses. 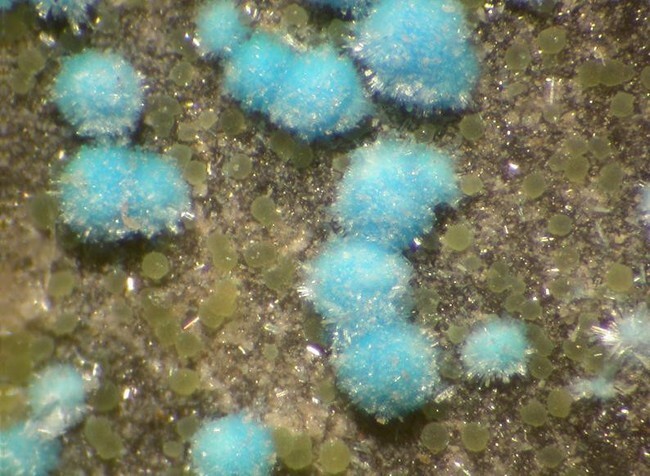 Pale green to turquoise-blue spherules and druses. Systematic Reference Series, National Mineral Collection of Canada, Geological Survey of Canada, Ottawa, Ontario, Canada; NMCC68091. Hydrothermally altered sedimentary rocks. From the upper supergene zone. Brecciated and silicified silty carbonate rocks (jasperoid). Fluellite 5 photos of Nevadaite associated with Fluellite on mindat.org. Variscite 1 photo of Nevadaite associated with Variscite on mindat.org. Wavellite 1 photo of Nevadaite associated with Wavellite on mindat.org. Jensen, M.C., Rota, J.C., Foord, E.E. (1995) The Gold Quarry mine, Carlin trend, Eureka County, Nevada. Mineralogical Record: 26: 449-469.
Cooper, M.A., Hawthorne, F.C., Roberts, A.C., Foord, E.E., Erd, R.C., Evans, H.T., Jr., Jensen, M.C. (2004) Nevadaite, (Cu 2+,◻,Al,V 3+)6[Al8(PO4)8F8](OH)2(H2O)22, a new phosphate mineral species from the Gold Quarry mine, Carlin, Eureka County, Nevada: Description and crystal structure. The Canadian Mineralogist: 42(3): 741-752. The following Nevadaite specimens are currently listed for sale on minfind.com. NBMG Spec. Pub. 31 Minerals of Nevada; Canadian Mineralogist (2004): 42(3): 741-752.